Elliot turns three today. Since we celebrated with his classmates at school on Wednesday, we aren’t having a (friend) party for him at home; it’s just going to be family. So I am trying to make it very special for him. 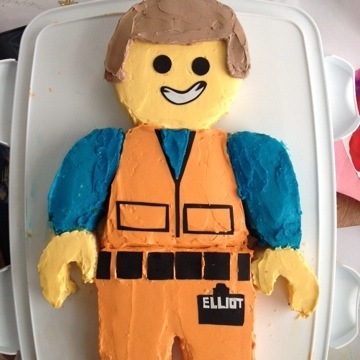 He requested an Emmet cake, so this is what I came up with. And there will be his favorite: balloons. And presents and scrambled eggs for dinner. I can’t believe he’s three. Happy Birthday, little man! Next Post Redoing A Roof: In Layman’s Terms. And the cake tasted as good as it looks! My son turned 8 in September, and he requested a Lego party. My cake was meant to look like Lego bricks, and it was a hot, hot mess. I slightly redeemed myself with other party details, but still. The cake. Ouch. This year he wants an Adventure Time party…yikes. The best I can come up with is rice krispies treats Lumpy Space Princess things. Happy birthday to your baby (for now!). Cake looks great! Did you have a template you used or any other tips? Hey! Thanks. No, no template. I just printed out a few images from online and went from there. (Color and shape.) And tips? Nope. Just cutouts using that black edible paper. Used an exact-o and a spatula. Hi is it possible for you to send me the recipe?